I recently bought the book Quilting Wide Open Spaces by Judi Madsen and I've learned a few things worth remembering. First, though I never did it before, I am enjoying stitching in the ditch. This means outlining major elements, like whole quilt blocks, with stitching before getting to the business of quilting the whole thing. This does a few things: first, it makes the blocks more defined. 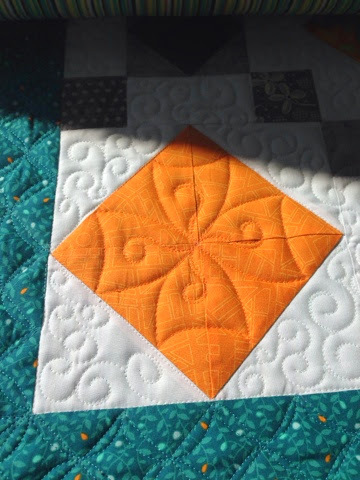 If you do an all-over quilt design, the actual piecing becomes less pronounced. This may be what you're after, but usually, if you have spent good time and effort making blocks, they are worthy of a little showcasing. Secondly, while you are toiling away stitching in all those ditches, you are preparing yourself for what this quilt "brings." You are thinking about the different elements that make up the whole, and which parts of it you most value. The way the blocks come together will strike you more thoroughly than when you were assembling them. I spend so much effort not screwing up that part, and little attention to how the quilt appears as a pieced-together unit. When ditch-stitching, I get a sense of what parts will require careful accents, and which parts are background. I also get time to think about how to quilt "front" quilt and background in a way that is different but complementary. In this quilt, I did the ditches first, then the white background, then the borders. After that, I did the grey sashing squares, and finally, I went to the different color blocks. In all, there were at least 7 passes of the quilt, after which I really felt as if it was done to the best of my ability. It was worth it to choose thread colors as I did the white background, putting them on my desk so I had the opportunity to edit as I thought about it, and compared those I'd chosen to different hued blocks in the same color family. Thirdly, when you've got the whole quilt "ditch-stitched," you then have everything anchored. As you are quilting through the quilt the first time, you can only roll the quilt in one direction. 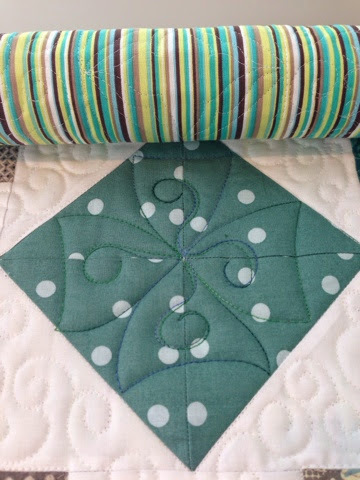 You can't go back up to an area you've already seen because the back and the front are on separate rollers, and once you've quilted them together, they can't be re-rolled backwards. That is, until you get to the end, and disconnect the front of the quilt from its roller by unpinning it. I then also trim the extra batting at the bottom. Since the quilt now is only attached to the backing roller and the roller above the quilting needle, I can go back and forth at will. This allows me to change colors and quilting styles and quilt top to bottom or bottom to top. There is no way I have the patience to change colors multiple times each time I roll the quilt a little bit. Ditch stitching has made it a much more stable process to go all the way through the quilt and do all the white, then backwards doing all the greens, then back down doing all the blues, etc... 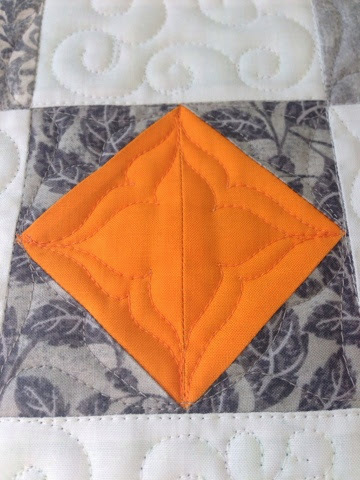 This makes the quilting more consistent, too. On my lazy quilts done all in one go, you can probably tell where I started and where I end because I get a little better at whatever it is I'm attempting. This way, it is harder to tell how much "learning" I required in the process.